The capital city of Vietnam is celebrating its thousand year anniversary, making it one of the oldest cities in the world, twice as old as Beijing and four times as old as New York! During these celebrations, the Vietnam Minister of Culture, Sports and Tourism, Hoang Tuan Anh, invited every citizen of Vietnam to vote for and support Halong Bay, one of the 28 Finalists competing to become one of the Official New7Wonders of Nature. and at the same time is inviting the world to vote for Halong Bay. 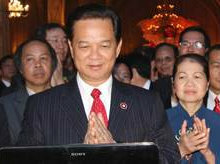 The Prime Minister of Vietnam, Nguyen Tan Dung, has shown the lead by voting for Halong Bay during his visit to the Vietnam pavilion at the Shanghai Expo.